These highlights do not include all the information needed to use Fenoglide ® safely and effectively. See full prescribing information for Fenoglide. To increase absorption of Fenoglide, take with food. 40 mg: White to off-white oval tablets. Debossed "FLO". 120 mg: White to off-white oval tablets. Debossed "FHI". To report SUSPECTED ADVERSE REACTIONS, contact Shore Therapeutics Drug Safety Department at 1-888-743-0571 or FDA at 1-800-FDA-1088 or www.fda.gov/medwatch. Fenoglide is indicated as adjunctive therapy to diet to reduce elevated LDL-C, Total-C, Triglycerides, and Apo B, and to increase HDL-C in adult patients with primary hyperlipidemia or mixed dyslipidemia. Lipid-altering agents should be used in addition to a diet restricted in saturated fat and cholesterol when response to diet and nonpharmacological interventions alone has been inadequate. Fenoglide is also indicated as adjunctive therapy to diet for treatment of adult patients with hypertriglyceridemia. Improving glycemic control in diabetic patients showing fasting chylomicronemia will usually reduce fasting triglycerides and eliminate chylomicronemia thereby obviating the need for pharmacologic intervention. Markedly elevated levels of serum triglycerides (e.g. >2,000 mg/dL) may increase the risk of developing pancreatitis. The effect of Fenoglide therapy on reducing this risk has not been adequately studied. Treatment with Fenoglide should be initiated at a dose of 40 mg/day in patients with mild to moderately impaired renal function, and increased only after evaluation of the effects on renal function and lipid levels at this dose. The use of Fenoglide should be avoided in patients with severely impaired renal function. Fenofibrate at doses equivalent to 87 mg to 130 mg fenofibrate per day [at the highest dose, comparable to Fenoglide, 120 mg] can increase serum transaminases [AST (SGOT) or ALT (SGPT)]. In a pooled analysis of 10 placebo-controlled trials, increases to >3 times the upper limit of normal occurred in 5.3% of patients taking fenofibrate versus 1.1% of patients treated with placebo. When transaminase determinations were followed either after discontinuation of treatment or during continued treatment, a return to normal limits was usually observed. The incidence of increases in transaminases related to fenofibrate therapy appear to be dose related. In an 8-week dose-ranging study, the incidence of ALT or AST elevations to at least three times the upper limit of normal was 13% in patients receiving dosages equivalent to 87 mg to 130 mg fenofibrate per day and was 0% in those receiving dosages equivalent to 43 mg or less fenofibrate per day, or placebo. Hepatocellular, chronic active and cholestatic hepatitis have been reported after exposures of weeks to several years. In extremely rare cases, cirrhosis has been reported in association with chronic active hepatitis. Regular periodic monitoring of liver tests, including serum ALT (SGPT) should be performed for the duration of therapy with Fenoglide, and therapy discontinued if enzyme levels persist above three times the normal limit. Fenofibrate increases cholesterol excretion into the bile, leading to risk of cholelithiasis. If cholelithiasis is suspected, gallbladder studies are indicated. Fenoglide therapy should be discontinued if gallstones are found. Treatment with fenofibrate increases risk of myopathy. Treatment with fenofibrate increases risk of rhabdomyolysis, usually in patients with impaired renal function. Myopathy should be considered in any patient with diffuse myalgias, muscle tenderness or weakness, and/or marked elevations of creatine phosphokinase (CPK) levels. Elevations in serum creatinine have been reported in patients on fenofibrate. These elevations tend to return to baseline following discontinuation of fenofibrate. The clinical significance of these observations is unknown. In the Coronary Drug Project, a large study of post myocardial infarction of patients treated for 5 years with clofibrate, there was no difference in mortality seen between the clofibrate group and the placebo group. Pancreatitis has been reported in patients taking fenofibrate. This occurrence may represent a failure of efficacy in patients with severe hypertriglyceridemia, a direct drug effect, or a secondary phenomenon mediated through biliary tract stone or sludge formation with obstruction of the common bile duct. In the FIELD trial, pulmonary embolus (PE) and deep vein thrombosis (DVT) were observed at higher rates in the fenofibrate- than the placebo-treated group. Of 9,795 patients enrolled in FIELD, there were 4,900 in the placebo group and 4,895 in the fenofibrate group. For DVT, there were 48 events (1%) in the placebo group and 67 (1%) in the fenofibrate group (p = 0.074); and for PE, there were 32 (0.7%) events in the placebo group and 53 (1%) in the fenofibrate group (p = 0.022). In the Coronary Drug Project, a higher proportion of the clofibrate group experienced definite or suspected fatal or nonfatal pulmonary embolism or thrombophlebitis than the placebo group (5.2% vs. 3.3% at five years; p < 0.01). Acute hypersensitivity reactions including severe skin rashes requiring patient hospitalization and treatment with steroids have occurred rarely during treatment with fenofibrate, including rare spontaneous reports of Stevens-Johnson syndrome, and toxic epidermal necrolysis. Mild to moderate hemoglobin, hematocrit, and white blood cell decreases have been observed in patients following initiation of fenofibrate therapy. The combined use of fenofibric acid derivatives, particularly gemfibrozil, and HMG-CoA reductase inhibitors results in an increased risk of rhabdomyolysis and myoglobinuria leading in a high proportion of cases to acute renal failure. Adverse reactions reported by 2% or more of patients treated with fenofibrate and greater than placebo during double-blind, placebo-controlled trials are listed in Table 1. Adverse reactions led to discontinuation of treatment in 5.0% of patients treated with fenofibrate and in 3.0% treated with placebo. Increases in liver tests were the most frequent events, causing discontinuation of fenofibrate treatment in 1.6% of patients in double-blind trials. The following adverse reactions have been identified during postapproval use of fenofibrate: myalgia, rhabdomyolysis, increased creatinine phosphokinase, pancreatitis, increased alanine aminotransaminase, increased aspartate aminotransaminase, renal failure, muscle spasms, acute renal failure, hepatitis, cirrhosis, nausea, abdominal pain, anemia, headache, arthralgia, and asthenia. Because these reactions are reported voluntarily from a population of uncertain size, it is not always possible to reliably estimate their frequency or establish a casual relationship to drug exposure. Because cyclosporine can produce nephrotoxicity with decreases in creatinine clearance and rises in serum creatinine, and because renal excretion is the primary elimination route of fibrate drugs including Fenoglide, there is a risk that an interaction will lead to deterioration of renal function. The benefits and risks of using Fenoglide with immunosuppressants and other potentially nephrotoxic agents should be carefully considered, and the lowest effective dose employed. The combined use of Fenoglide and HMG-CoA reductase inhibitors should be avoided unless the benefit of further alterations in lipid levels is likely to outweigh the increased risk of this drug combination. In a single-dose drug interaction study in 23 healthy adults the concomitant administration of fenofibrate and pravastatin resulted in no clinically important difference in the pharmacokinetics of fenofibric acid, pravastatin, or its active metabolite 3Î±-hydroxy iso-pravastatin when compared to either drug given alone. Since bile acid sequestrants may bind other drugs given concurrently, patients should take Fenoglide at least 1 hour before or 4-6 hours after a bile acid binding resin to avoid impeding its absorption. Fenofibric acid exposure is not influenced by age. However, elderly patients have a higher incidence of renal impairment. Dose selection for the elderly should be made on the basis of renal function. Fenofibric acid is known to be substantially excreted by the kidney, and the risk of adverse reactions to this drug may be greater in patients with impaired renal function. Fenofibrate should be avoided in patients with severe renal impairment and dose reduction is required in patients with mild to moderate renal impairment. The effects of fenofibric acid seen in clinical practice have been explained in vivo in transgenic mice and in vitro in human hepatocyte cultures by the activation of peroxisome proliferator activated receptor Î± (PPARÎ±). Through this mechanism, fenofibrate increases lipolysis and elimination of triglyceride-rich particles from plasma by activating lipoprotein lipase and reducing production of apoprotein C-III (an inhibitor of lipoprotein lipase activity). The resulting fall in triglycerides produces an alteration in the size and composition of LDL from small, dense particles (which are thought to be atherogenic due to their susceptibility to oxidation), to large buoyant particles. These larger particles have a greater affinity for cholesterol receptors and are catabolized rapidly. Activation of PPARÎ± also induces an increase in the synthesis of apoproteins A-I, A-II and HDL-cholesterol. A variety of clinical studies have demonstrated that elevated levels of total cholesterol (total-C), low density lipoprotein cholesterol (LDL-C), and apolipoprotein B (apo B), an LDL membrane complex, are risk factors for human atherosclerosis. Similarly, decreased levels of high density lipoprotein cholesterol (HDL-C) and its transport complex, apolipoprotein A (apo AI and apo AII) are risk factors for the development of atherosclerosis. Epidemiologic investigations have established that cardiovascular morbidity and mortality vary directly with the level of total-C, LDL-C, and triglycerides, and inversely with the level of HDL-C. The independent effect of raising HDL-C or lowering triglycerides (TG) on the risk of cardiovascular morbidity and mortality has not been determined. Fenofibric acid, the active metabolite of fenofibrate, produces reductions in total cholesterol, LDL cholesterol, apolipoprotein B, total triglycerides, and triglyceride-rich lipoprotein (VLDL) in treated patients. In addition, treatment with fenofibrate results in increases in high density lipoprotein (HDL) and apoproteins apo AI and apo AII. 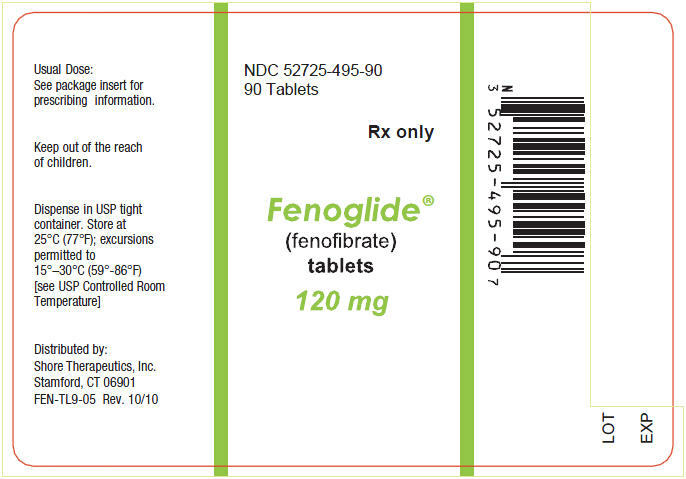 Plasma concentrations of fenofibric acid after single-dose administration of Fenoglide (fenofibrate) Tablets, 120 mg are equivalent to those of Fenofibrate 130 mg capsules under high-fat conditions. Absorption: The absolute bioavailability of fenofibrate cannot be determined as the compound is virtually insoluble in aqueous media suitable for injection. However, Fenoglide is well absorbed from the gastrointestinal tract. Following oral administration in healthy volunteers, approximately 60% of a single dose of radiolabelled fenofibrate appeared in urine, primarily as fenofibric acid and its glucuronate conjugate, and 25% was excreted in the feces. Peak plasma levels of fenofibric acid from Fenoglide occur, on average, within 2 to 3 hours after administration. Distribution: In healthy volunteers, steady-state plasma levels of fenofibric acid were shown to be achieved within a week of dosing and did not demonstrate accumulation across time following multiple dose administration. Serum protein binding was approximately 99% in normal and hyperlipidemic subjects. Metabolism: Following oral administration, fenofibrate is rapidly hydrolyzed by esterases to the active metabolite, fenofibric acid; no unchanged fenofibrate is detected in plasma. Excretion: After absorption, fenofibrate is mainly excreted in the urine in the form of metabolites, primarily fenofibric acid and fenofibric acid glucuronide. After administration of radiolabelled fenofibrate, approximately 60% of the dose appeared in the urine and 25% was excreted in the feces. Fenofibric acid from Fenoglide is eliminated with a half-life of 23 hours, allowing once daily administration in a clinical setting. Pediatrics: Fenoglide has not been investigated in adequate and well-controlled trials in pediatric patients. Gender: No pharmacokinetic difference between males and females has been observed for fenofibrate. Race: The influence of race on the pharmacokinetics of fenofibrate has not been studied; however, fenofibrate is not metabolized by enzymes known for exhibiting inter-ethnic variability. Therefore, inter-ethnic pharmacokinetic differences are very unlikely. Hepatic Insufficiency: No pharmacokinetic studies have been conducted in patients having hepatic insufficiency. Drug-Drug Interactions: In vitro studies using human liver microsomes indicate that fenofibrate and fenofibric acid are not inhibitors of cytochrome (CYP) P450 isoforms CYP3A4, CYP2D6, CYP2E1, or CYP1A2. They are weak inhibitors of CYP2C19 and CYP2A6, and mild-to-moderate inhibitors of CYP2C9 at therapeutic concentrations. In a 21-month study in mice at doses of 10, 45, and 200 mg/kg (approximately 0.2, 0.7 and 3 times the maximum recommended human dose on the basis of mg/meter2 surface area), there were statistically significant increases in liver carcinoma at 3 times the maximum recommended human dose in both males and females. In a second 18-month study at the same doses, there was a significant increase in liver carcinoma in male mice and liver adenoma in female mice at 3 times the maximum recommended human dose. Fenofibrate has been demonstrated to be devoid of mutagenic potential in the following tests: Ames, mouse lymphoma, chromosomal aberration, and unscheduled DNA synthesis. Administration of 10 times the maximum recommended human dose to female rats on days 6-15 of gestation caused an increase in gross, visceral and skeletal findings in fetuses (domed head/hunched shoulders/rounded body/abnormal chest, kyphosis, stunted fetuses, elongated sternal ribs, malformed sternebrae, extra foramen in palatine, misshapen vertebrae, supernumerary ribs). The effects of fenofibrate at a dose equivalent to 120 mg Fenoglide per day were assessed from four randomized, placebo-controlled, double-blind, parallel-group studies including patients with the following mean baseline lipid values: total-C 306.9 mg/dL; LDL-C 213.8 mg/dL; HDL-C 52.3 mg/dL; and triglycerides 191.0 mg/dL. Fenofibrate therapy lowered LDL-C, Total-C, and the LDL-C/HDL-C ratio. Fenofibrate therapy also lowered triglycerides and raised HDL-C (see Table 2). • Duration of study treatment was 3 to 6 months. The effects of fenofibrate on serum triglycerides were studied in two randomized, double-blind, placebo-controlled clinical trials of 147 hypertriglyceridemic patients. Patients were treated for eight weeks under protocols that differed only in that one entered patients with baseline triglyceride (TG) levels of 500 to 1500 mg/dL, and the other TG levels of 350 to 500 mg/dL. In patients with hypertriglyceridemia and normal cholesterolemia with or without hyperchylomicronemia, treatment with fenofibrate at dosages equivalent to 120 mg Fenoglide (fenofibrate) Tablets per day decreased primarily very low density lipoprotein (VLDL) triglycerides and VLDL cholesterol. Treatment of patients with elevated triglycerides often results in an increase of low density lipoprotein (LDL) cholesterol (see Table 3). Distributed by: Shore Therapeutics, Inc.